Android Nougat was released on August 22 but Nexus 7 Android Nougat was missing. But after the Android Nougat Source code release now the Nexus 7 Android Nougat AOSP ROM is available unofficially which is brought to you by developer zaclimon and DevSwift1. Every Nexus 7 user must be thankful to the developers for their priceless efforts and lightning fast development. Installing a custom ROM on a Nexus device requires the bootloader to be unlocked on the Nexus phone, which may VOID your warranty and may delete all your data. Before proceeding further you may consider backup all data on the phone. You are the only person doing changes to your phone and I cannot be held responsible for the mistakes done by you. 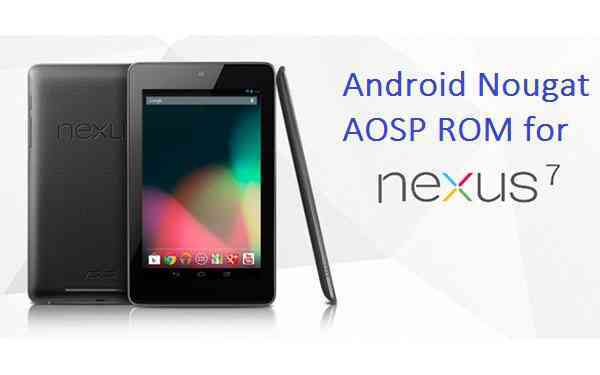 Download the Nexus 7 Nougat AOSP ROM zip file and a suitable Nougat Gapps zip file from the above download link and copy both the files to phone. First flash the Nexus 7 Nougat ROM ZIP from device. Stay tuned or Subscribe to the Nexus 7 forum For other Android Nougat ROMs, CyanogenMod 14 ROMs, other ROMs and all other device specific topics. The development thread for this ROM is here.